is in the region of Cappadocia changes according to regions and reached up to 100 m of thickness. today formations are called ‘fairy chimneys’. 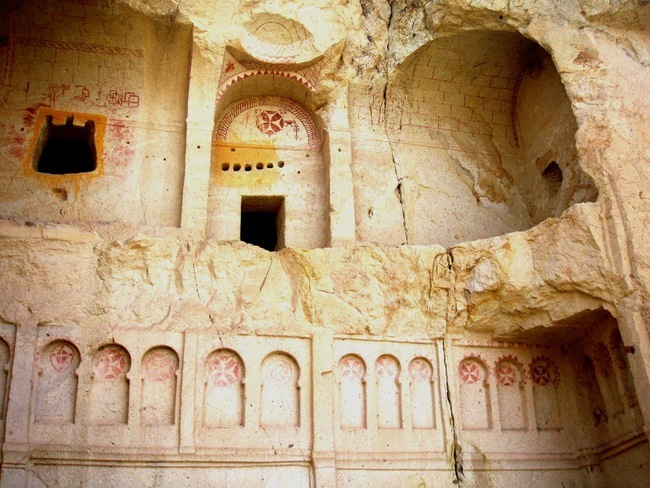 Göreme Open Air Museum ; It is a rock settlement place located 1 km east of the town of Goreme. technique. The crafts carved in the churches were choosen from the Bible and from Jesus Christ’s life. Catherine Chapel and Çarıklı Church. indicated to be built in the year of 1055. Saint Basileos Chapel ; The chapel was constructed with three apsises and has a rectangular plan. Saint Theodora on horse was figured. arm, and Saint Barbara on the West arm cross. Theodora and Catherine on the right Wall of the entrance. is a figure of Saint Eusthatios on the right side of the apsis wall. one of the well known saints of Christian world. He appears as a local Saint.